10 mines containing two kilos of dynamite were found and removed Saturday from an ATM in Quang Ninh Province. The explosives were discovered Saturday morning when a bank staff came to refill cash in the automatic teller machine. The ATM booth stands next to an apartment complex home to thousands of people in Uong Bi Town, Quang Ninh Province, two hours east of Hanoi. 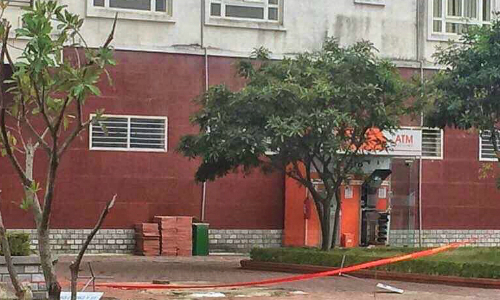 The discovery prompted police to evacuate residents within a 400 meters radius around the ATM. Most people living in the complex are workers. A majority of them had left home for work at the time the explosives were found. Only around 400 people were at home, local officials said. The explosives were removed at round 2 p.m. on Saturday and safely dealt with, Lt. Col Pham Thanh Toan said. Toan said the mines had been set to explode, and if they hadn’t been discovered in time, the explosion could have hurt people within several hundreds of meters radius. He said the perpetrators were seeking to destroy property and hurt people rather than steal money. The mines were strong enough to blow up the ATM booth, he added. Police and local authorities are investigating the case further, and checking all ATMs in the town.